These are just some of the questions answered by Adrià in the exhibition ‘Ferran Adrià. Auditing the Creative Process’ which recently opened at the Fundación Telefónica Space in Lima. This is the first exhibition on the Catalan chef to be held in Lima, the biggest of its kind ever produced and the first to explore creative processes, organized in collaboration with Fundación Telefónica. Four years after closing El Bulli and having raised gastronomy to an unprecedented level, the most celebrated international chef reveals his creative process and the keys to the success of the Cala Montjoi restaurant. The exhibition, ‘Ferran Adrià. Auditing the Creative Process’, which can be visited free of charge at the Fundación Telefónica Space from 15 July to 31 October, immerses visitors in the creative universe of Adrià and his team. This is not just an exhibition of gastronomy but a journey through the hugely successful creative process of El Bulli; success that is rooted in constant reinvention, based on the parameters of innovation and creativity, characteristics that have made it a global benchmark, and not only in the gastronomic sphere. 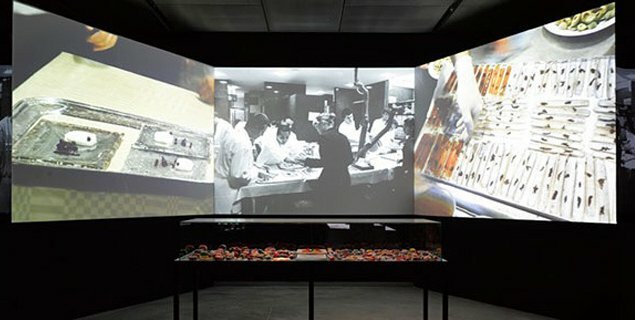 The exhibition ranges from huge murals to hundreds of drawings by Adrià himself, not forgetting the iconic tools and objects of El Bulli, and even a recreation of the very kitchen where they prepared the 1,846 dishes that defined the history of this unparalleled restaurant. ‘Ferran Adrià. Auditing the Creative Process’ is the first representation of the work of elBulliDNA, a multidisciplinary team of around a dozen people who are studying and deciphering the creative process at the elBulliLab in Barcelona in league with elBulli1846 in Cala Montjoi. This is the most comprehensive exhibition ever produced on the Catalan chef’s work and provides a veritable map of a lifetime devoted to creation.